AccessoryGeeks.com | Portable Ironing Mat, Iron Anywhere - Ideal For Small Apartments, Travel, Office, and More! | Free Shipping! Portable Ironing Mat, Iron Anywhere - Ideal For Small Apartments, Travel, Office, and More! Eutuxia's Ironing Mat transforms the top of laundry appliances into an instant compact ironing board. 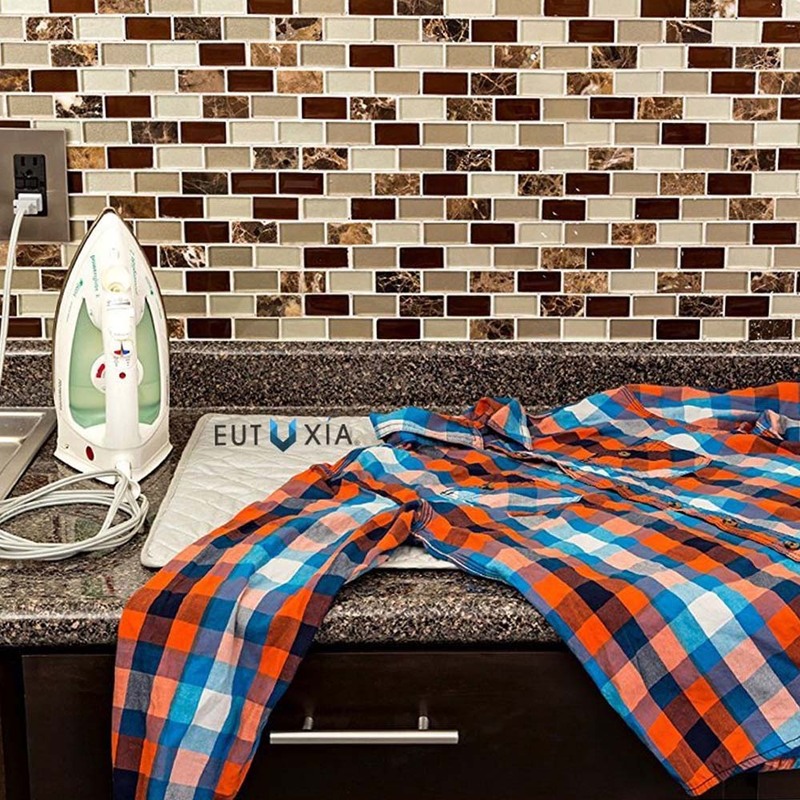 Magnets on each corner of the ironing mat instantly transforms any metallic surface into an ironing board. 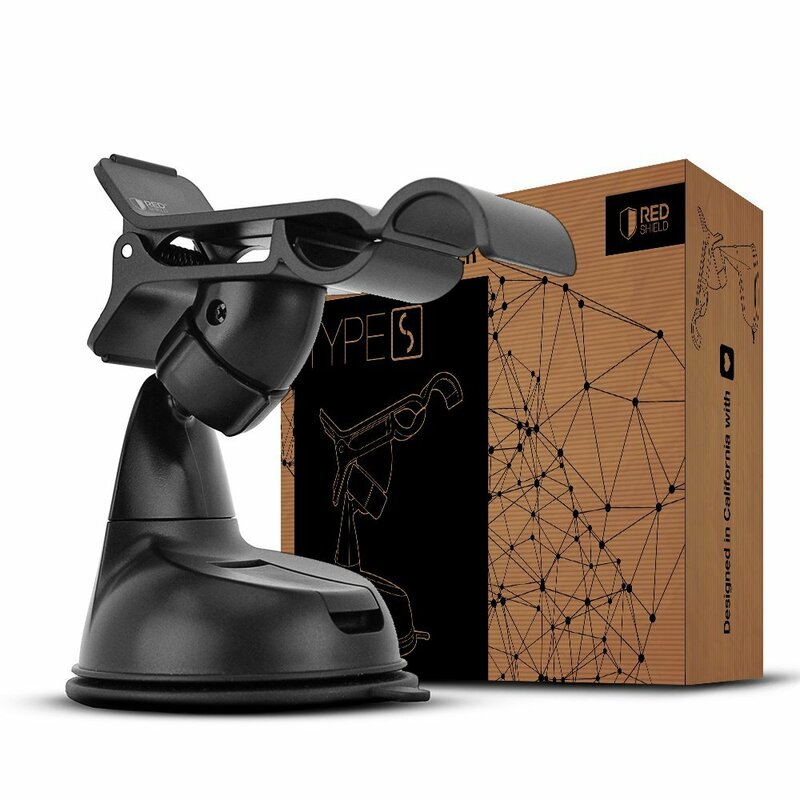 You can also use it on top of any flat surface without any problems. 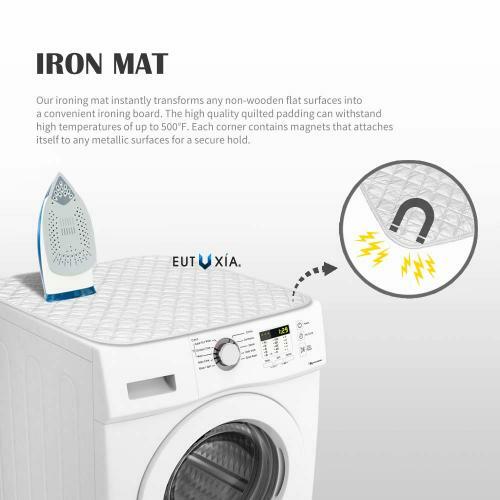 Each corner of the mat contains a high quality magnet that attaches itself to any flat metallic surface so that it can be secured while you iron away. Flexible and portable. Iron mat can be rolled up or folded three times for space-saving and easy storage. 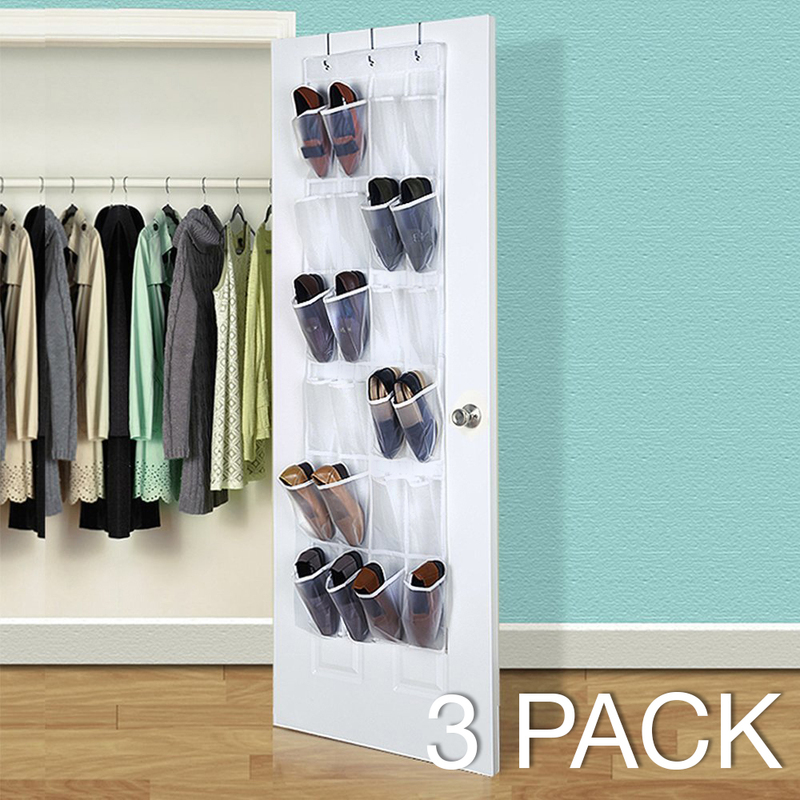 It will fit in any cabinet or even on top of your washer or dryer without taking up too much space. Take it on your vacations or business trips! It’s a perfect traveling companion. Iron mat is made out of high quality polyester and cotton. 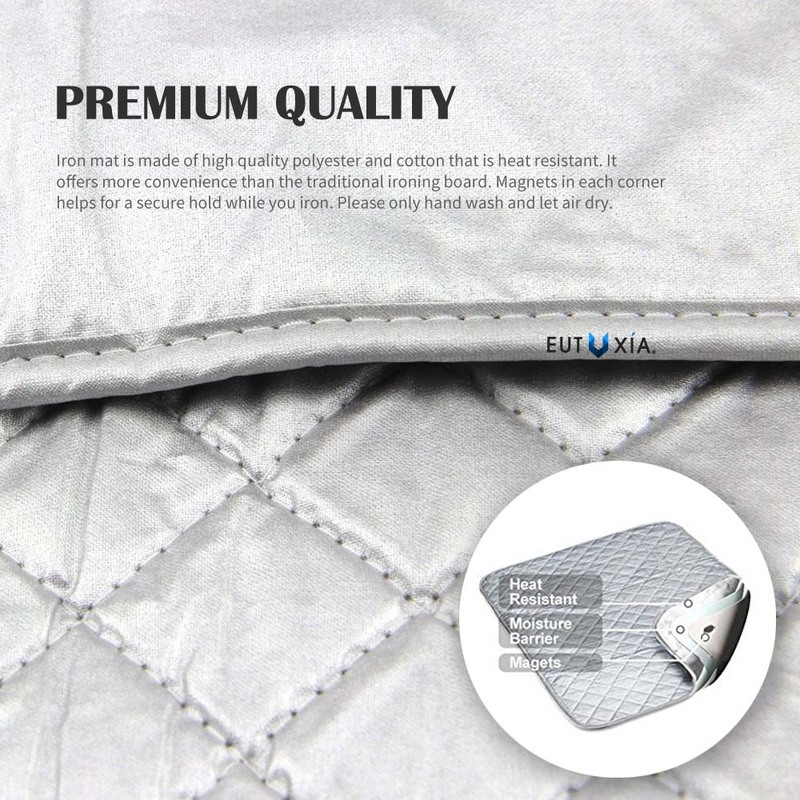 Its quilted high heat resistant pad offers a wider and better workspace than a regular ironing board. It can withstand the temperatures of most irons. You never have to take out your heavy ironing board for simple touch ups again. 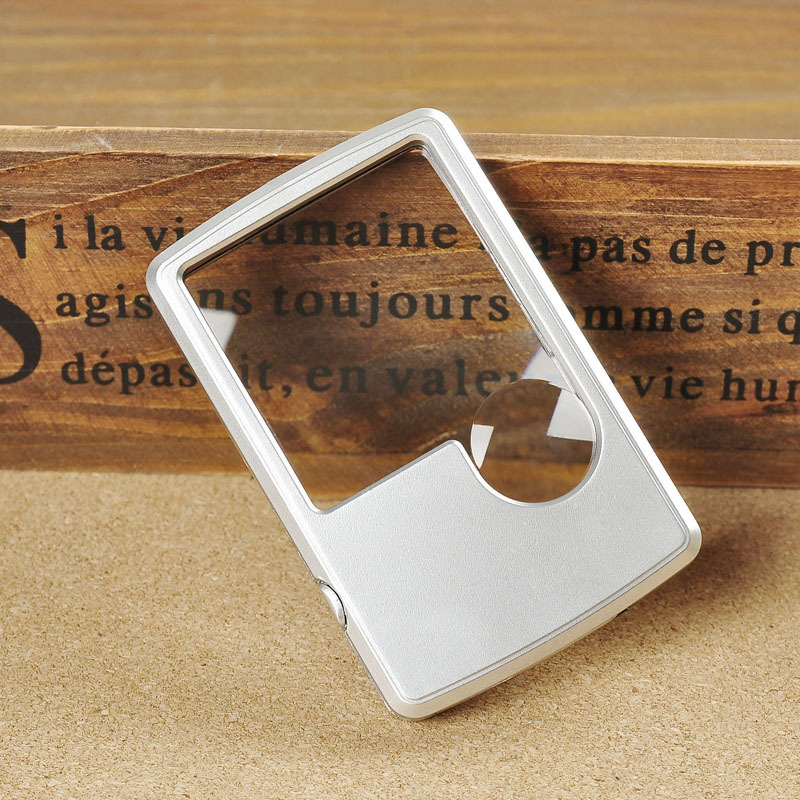 Magnets on each corner help for a secure hold while you iron on top of metal surfaces. Please only hand wash and air dry. Easily handle any sized ironing job wherever you want. Do a quick touch up to get rid of those wrinkles after a wash. We recommend using this on metallic surface for a secure hold while you iron. Please try to avoid ironing on wood or plastic surfaces. 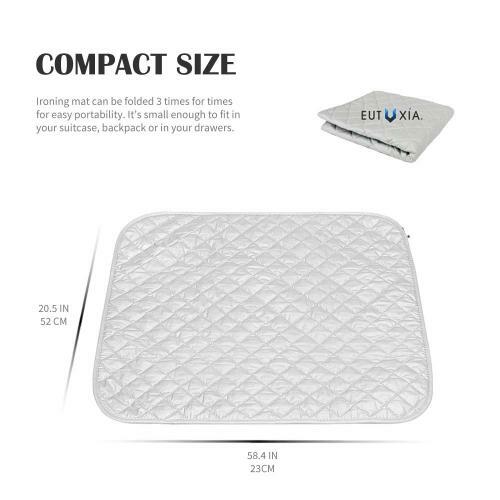 This ironing mat is small and valuable to those who live in studio apartment, dorms, RVs, or other small living places. It may serve a better purpose to those who live in smaller sized places due to its small size, but anyone can use it. Iron mat is 23 x 20.5 inches and about 0.25 inches thick. 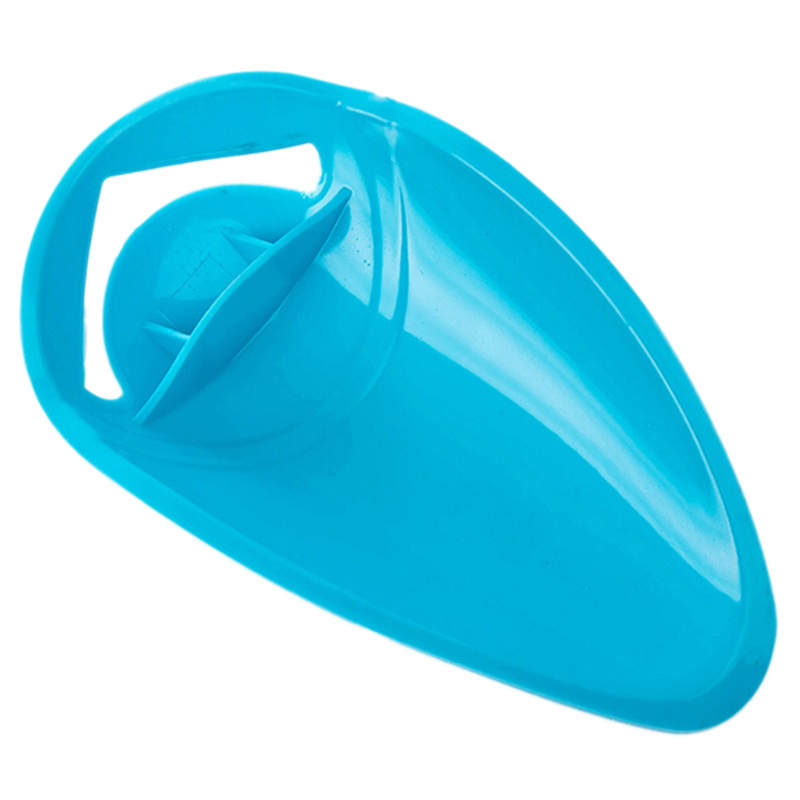 It can be folded three times for easier carry and storage. When it’s folded, it is 10.5 x 8 inches and about 1.25 inches thick. 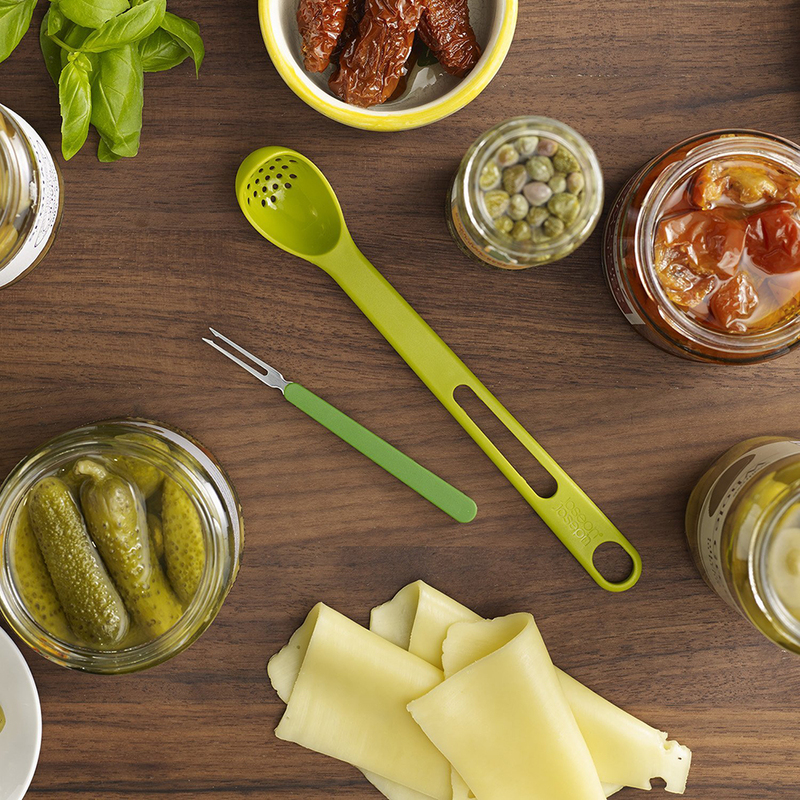 It’s definitely small enough to fit in your suitcase or even storing it in your cabin. 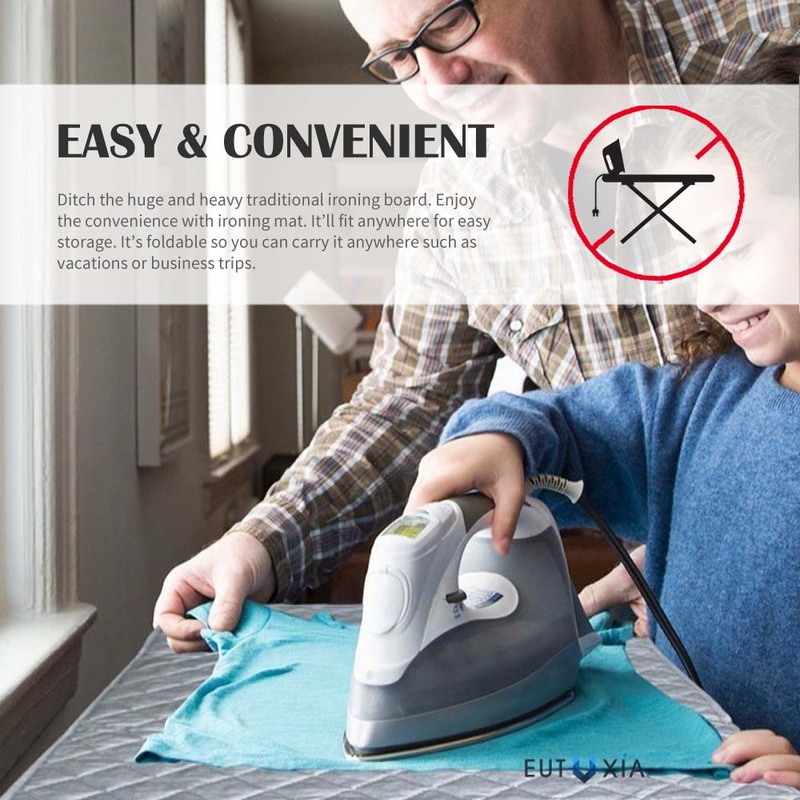 Portable Ironing Mat, Iron Anywhere - Ideal For Small Apartments, Travel, Office, and More! 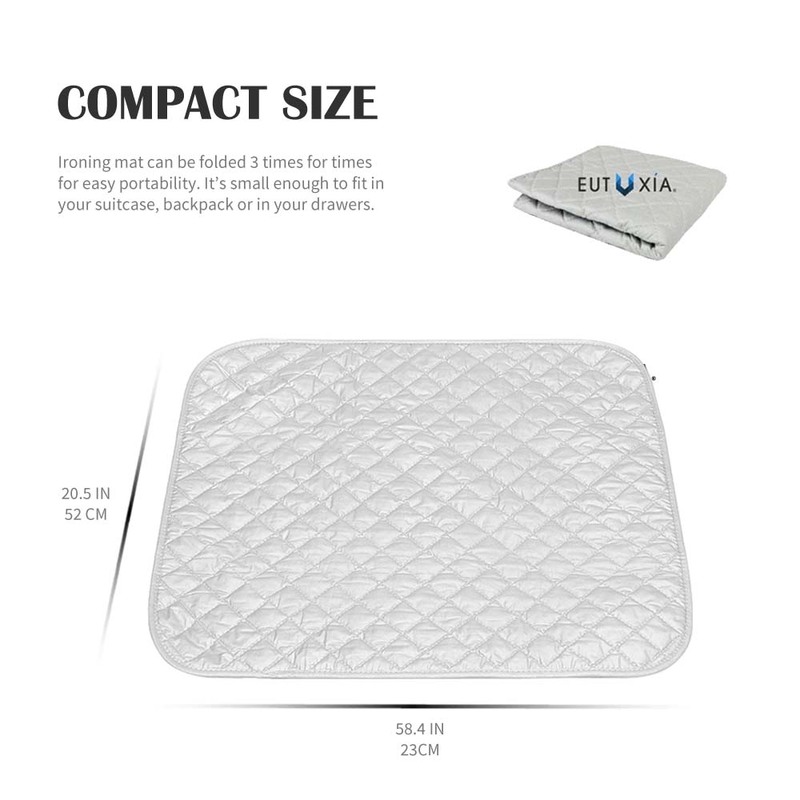 Eutuxia's Ironing Mat transforms the top of laundry appliances into an instant compact ironing board. Place the wide magnetic, heat resistant, quilted pad over a washer, dryer or any metal surface and press clothes immediately. Fold, roll or hang when done. Great for homes, apartments, dorms and RVs where space is valuable. 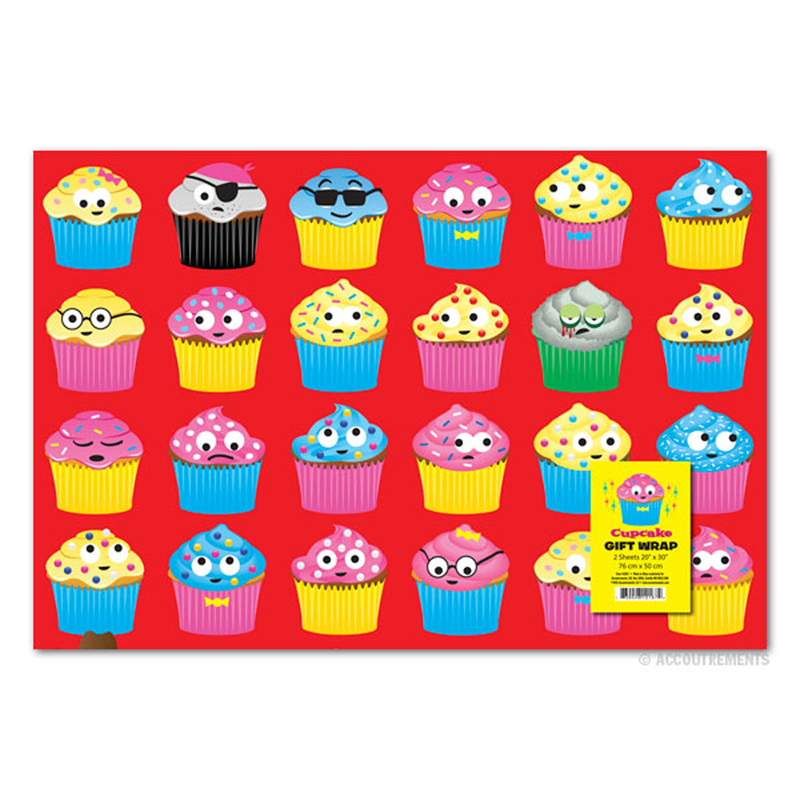 MAGNETS on each corner transforms any metallic surface into an ironing space or use on any flat surface. Magnet pull force is twice as strong as any competitive item currently on the market. PORTABLE DESIGN. flexible design allows the mat to be rolled up, folded flat, or hung up between uses for space-saving and easy storage. 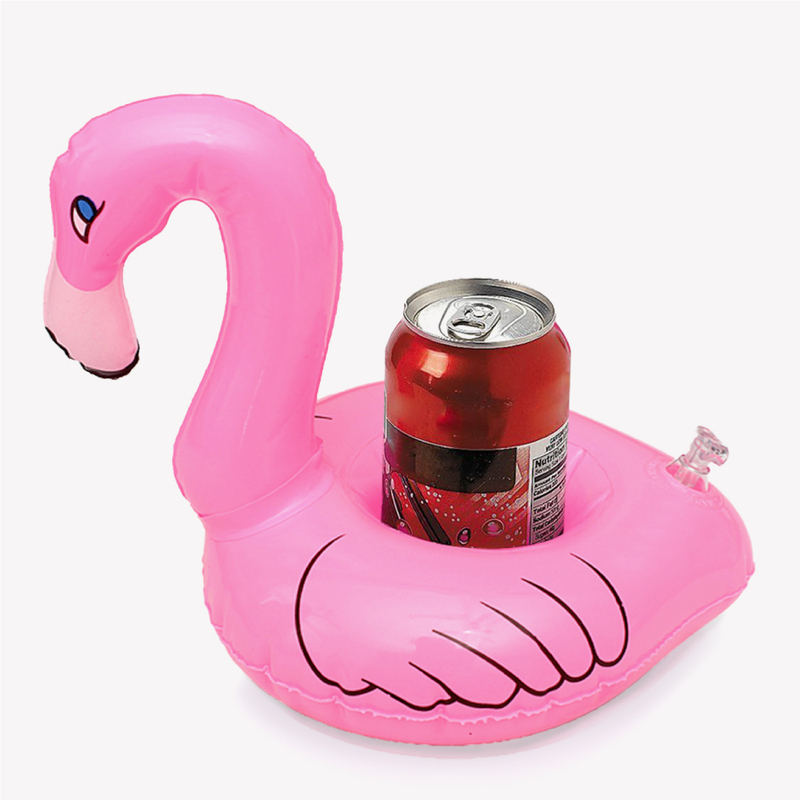 it will fit completely atop most standard sized washer or dryers. HIGH QUAILITY. Quilted high heat resistant pad offers a wider workspace than an ironing board. Polyester, cotton Fabric and fill - 33 1/2" x 19" Never drag out the ironing board for little touch ups again. Each corner of the mat contains a heavy-duty magnet that attaches itself to any metallic body surface for a secure hold while you iron. This ironing pad covers the entire top of the dryer and stays firmly in place. It is so convenient compared to having to take out and set up an ironing board. Easy to use and store. Great idea! Such a time, space and hassle, safer! It makes it all the more easier to iron things immediately after they come out of the dryer. I recommend this product. I love this Magnetic Laundry Pad! It fits perfectly over my dryer so I can iron things that I need. It is very convenient. Feels like a good quality item and you can't beat the price! 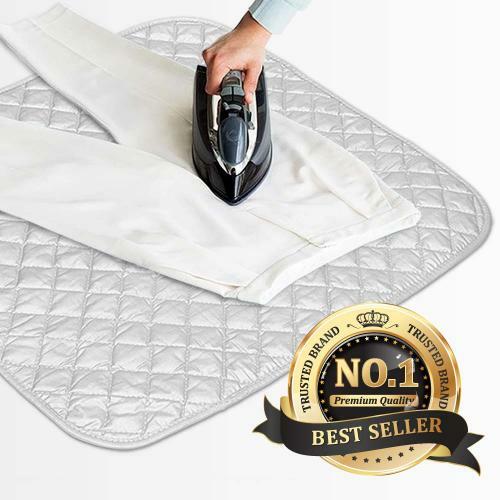 I love this ironing mat, this is so useful! I store it on the side of the washer and pull it out when I need to use the iron! The magnets are strong and the fabric holds up really well! I am so glad I bought this ironing mat blanket. I used it on my dining table with no issues. So convenient to fold and tuck away in a closet rather than having a giant board. Such a simple idea yet something I have found it's very useful, space and hassle saver! I don't have to drag the ironing board in and out of the closet. Just put it on the side of the washing machine. Awesome! Great idea! This ironing pad covers the entire top of the dryer and stays firmly in place. It is so convenient compared to take out and set up an ironing board. Works as intended! Very convenient for travel and great for the top of my washer and dryer to iron. So much easier than an ironing board up much less space. Perfect little Ironing Mat! I keep it next to my sewing machine and serger so I can press seams as I sew. It's easy to fold and tuck away when not needed. This ironing pad covers the entire top of the dryer and stays firmly in place. It is so convenient to use compared to having to take out and set up an ironing board. 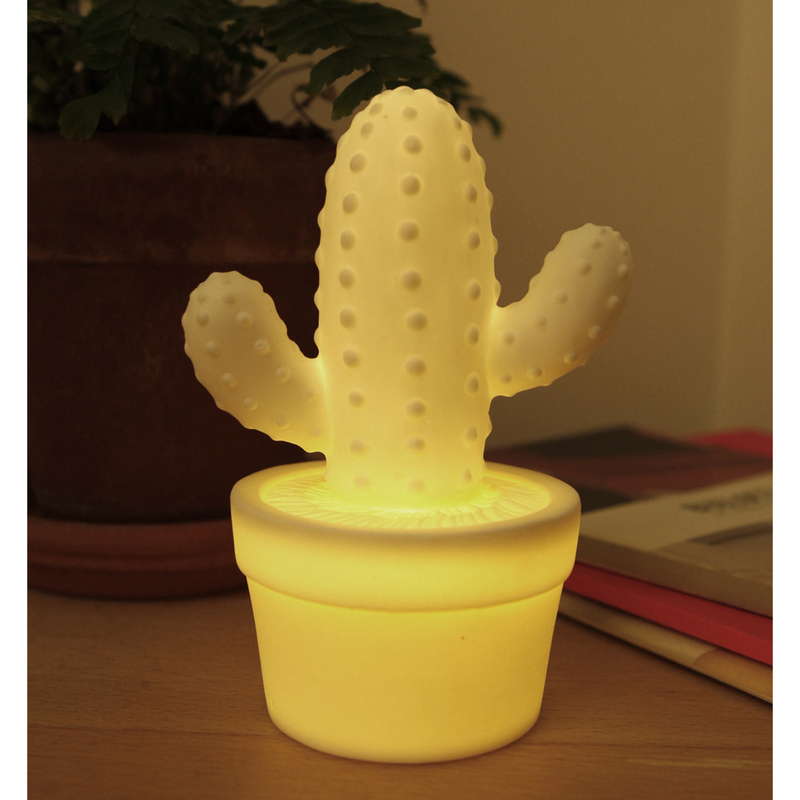 Perfect for a small area. Finally! It's nice that it stays on my dryer and it's easy to keep clean and use. I comes up with this great inventions!